To Dog With Love: Wordless Wednesday: BlogPaws or Bust! Wordless Wednesday: BlogPaws or Bust! 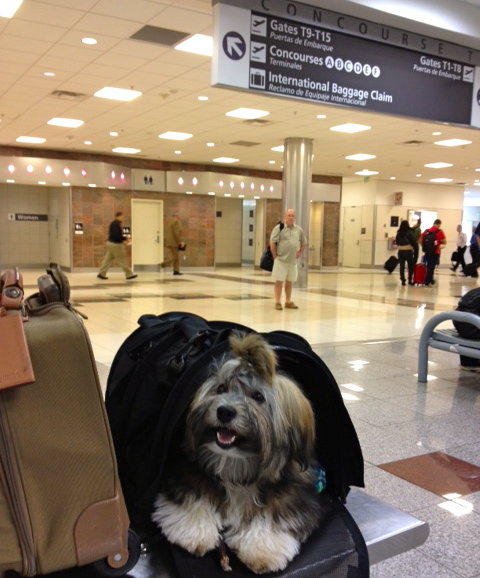 @RoccoHavanese and I are on our way! Can't wait to see our old pals and meet new ones. Rocco will be eight months old tomorrow and he's ready to rock! We're fortunate this year to be sponsored by Purina, and they will be hosting two presentations on Friday we think will be worth attending! At 11 a.m. Arleigh Reynolds will host "The Link Between Diet and Domestication: 10,000 Years of Dietary Influences on the Canine Genome" and at 2 p.m., Brenda Bax and David Meyer (of Adopt A Pet) will present "Pet Welfare in America." I had the pleasure of meeting both Brenda and Arleigh during a visit to Purina last October. See you at BlogPaws! Come by and give Rocco a pat (and a treat!) if you see us! Dad and Flat Brian will see you Thursday evening and they can't wait to meet Rocco! Thank you! Rocco did great on the plane! Luna and I hope to meet you both! Travel safe! Have a great time!!! Rocco will be a star there! Looks like you're both ready for some fun! Have a great time at Blog Paws and happy WW! Oh wow, he looks so cute! Hope you have a great time!